I received an email the other day from a lady who wanted to know why I don't do more canning/preserving posts. The plain and simple answer is that I only post about what I do, I don't do a lot of preserving, so I can't write about it more than I do. We do things differently here. Speaking from my own experience, we don't have to put up a lot of food in jars because we have a garden we can walk out to most of the year to pick fresh what we want to eat. In colder climates, where growing food is impossible half the year, canning gives options that otherwise are not available. The theory is to grow as much as you can during the warm months, harvest in autumn and can the excess for eating over the cold winter. That is a great way to save money, eat the best organic produce and know for sure what you're eating. In Australia it's fairly common to put up those foods that you really enjoy, that you can make yourself, and that taste better homemade than bought. I usually put up various tomato products - sauce, pasta sauce/pizza topping and tomato relish. I generally do some sort of jam - I love peach jam so I buy a box of peaches in season and put up several jars of peach jam. Some years I'll do a strawberry jam as well, but they're different seasons here. Strawberries are a winter crop, peaches are abundant in summer. At some time during lemon season, which is winter and again in early spring here, I'll make up several jars of lemon butter and juice all the lemons I can lay my hands on. I freeze the juice in two litre containers to make cordial with it year round, but especially in summer. Late summer I'll put up a few jars of bread and butter cucumbers and pickled beetroot. But none of these foods are meant specifically for winter meals - we never can meat, soup or salmon, we eat it all fresh, year round. When there is an abundance of beans, carrots, peas or silverbeet, I blanche and freeze - it's easier, cheaper and takes less time. For those reasons, a small preserving kit, circa 1970s, suits me well. It's not a handsome unit but it does the job required for my sporadic preserving sessions. And let me tell you that nothing you can buy in the shops is better than homemade lemon butter, peach jam or tomato relish; it's like manna from heaven. I've never had the need for a pressure canner and most of the time I use recycled jars. And we're still here to tell the tale. Don't get me wrong, I think the ability to preserve food for later use is one of the most helpful of all the household tasks we can learn. It's complex, in that it has health and safety aspects, but when the time it put into the learning of it, it is a fairly straight forward task. It's just that with a garden full of fresh food most of the year, we don't need to preserve food unless we have too much of it. What do you put up and when do you do your canning/preserving? For me (I'm in Canada) vegetable canning start in may with asparagus and finish around october. This year, I started lacto-fermented veggies and sprouting for winter. Because we are meat consommer, than I have 4 youngs kids, I try to pressure-can my meat late in fall (october-november) or in winter. This save lot of time for me to have spaghetti sauce, chili and chicken in the jar. So I have more time with the kids and to o the other stuffs. I just started canning this year, and am looking forward to trying my hand at a few more things the next time around. Your creations look awfully tasty! We like preserving almost all kinds of vegetables and fruits. I usually have a very big garden but unfortunately this year that wasn't possible. This is the first year I have ever had to buy vegetables or fruit at a grocery store and I have to cringe every time I get something like that off the shelf. We too have access to fresh stuff all year round although I don't manage to grow much of it myself (I'm death to plants!) but the veggie shops are plentiful and nearby! So I only preserve the stuff that we really like because it is nicer homemade than shopbought. Chutney and orange squash (thanks to this site! )in particular although candied peel is a regular favourite too. I just did about a gallon of piccalili which maturing in the larder now. I can't keep strawberry jam on the shelf though! They eat it as fast as I can make it! Like you in Australia I preserve food because it tastes great or we have too much in the garden. I will often buy a box of tomatoes when they are $1 a kilo and make homemade tomato sauce ie ketchup and tomato relish, but because they taste so nice compared to bought stuff they don't last long! It would be such a luxury to walk out most of the year and be able to pick fresh veg! Here in Canada, that's certainly not the case...so we can alot of food. Spring is Rhubarb, stewed, and Strawberry jam, both fruits are frozen as well. Then we get into beans, canned, peas, sweet and dill pickles, and various relishes including zucchini. I tried dehydrating zucchini for the first time this year and it worked great! We also can peaches in a light syrup and pears in a light syrup, also plums. We live in a crab apple orchard, so make crab apple jelly, every few years we seem to get a good wild grape year, or a good blackberry year and we make jam out of those. Oh yes, and we have 3 large rows of raspberries, so we make jam, jelly, and freeze them whole. Then the tomato harvest which at our place is pretty huge. We make tomato sauce, pizza sauce, salsa, and stewed tomatoes. I think we canned about 25-30 bushels last year...then it is apple season...frozen, dried, and lots of apple sauce and if I have the energy a couple dozen apple pies, unbaked and frozen. We grow potatoes, carrots, winter squash and onions and store those. I live in Indiana, USA where we have cold, snowy winters. I started learning to can when we bought our current home about 3 years ago and finally had a yard to put a garden in. This year I canned green beans, tomatoes, spaghetti sauce and chicken soup. I have made mint jelly and canned corn in the past, but we prefer our corn frozen so I didn't go that route this year. We also freeze a lot of our garden produce, but some things turn out better canned. I want to expand the things that I can each year - as I much prefer serving my family food that comes from our garden than something I bought at the grocery store. We don't can because I don't know how. :| I'm going to learn though and make jams and chutneys at the very least because a couple of jars of either and some fancy bread rolls or cakes make good hosuewarming or hostess gifts. Next year we'll be able to grow enough produce to make it worth while though, for the past few years I've just frozen or dried excess stuff. Like the 2 gallons of yummy pasta/pizza sauce sitting in our freezer. Here in Canada, year round gardening is NOT an option at all! We can almost all of our fruit for the winter in extra light syrup, and it tastes so fresh! Like having a taste of summer in the middle of winter! We did peaches, pears, and apricots this year. I also did strawberry, blueberry, raspberry,and apricot jam, and last year did pear sauce, pumpkin pie pear butter, cranberry sauce, and plum butter. It is so nice to have that during the winter! Living in Ohio, I do a great deal of canning and will be doing more next year. This year I put up both in jars and in the freezer tomatoes. I froze green peppers. Made sauerkraut and dried some beans. I also made pickled banana peppers. Due to a late frost we had no apples from the tree but next year I'll be learning different ways to preserve them. Our garden doubled in size for 2010 and we will again increase it for 2011. Are you pressure canning or water bath canning your chicken stock? I do a lot of canning, we live in one of those "colder climates, where growing food is impossible half the year" areas. So if I want to enjoy the labor I put into the garden, I need to can, freeze, and dehydrate. We are now enjoying home canned tomatoes, frozen and dehydrated berries, chicken stock, chicken soup, tomato soup, many salsas and jams. Well, I won't go on, it is a lot of work, but I enjoy it and it is worth the effort. I know my food is nutritious and it tastes so good. I think you are right when you say it is a valuable skill to learn. Like all of the other Canadians responding, I can as much as I can when it's in season. That means ketchup, tomatoes, chutneys, pickles (beans, carrots and cukes), sauerkraut, applesauce, peaches, pears, all sorts of jams, apple juice, apple cider, cherries, rhubarb juice. I prefer my veggies frozen and I don't have a pressure canner. It's great to be able to go to the basement and pick up something that I know what's in it and where it came from. I also waste less food when I know the work that went into preserving and growing it! Like you, I do not do a lot of preserving beause I grow vegies all year round now, and winter in South Australia is my most enjoyable vegie gardening time because I do not need to do any watering - just plant, pick and eat. We eat meat once or twice a week - mainly free range chicken or kangooroo - both abundant, healthy and cheap. I do preserve tomatoes and excess summer fruit with fowlers vacola's simple,natural preserving kit, which is very quick and easy to use. I also make all our jams, cucumbers in spices & vinegar (I follow your recipe), and jars of local wild harvested olives. I freeze some fruit, lemon juice and tomatoes. Could you tell us more about your 1970's preserving kit & perhaps post a photo? I haven't done a lot of preserving of late because there wasn't much excess in the drought years but there will be stewed peaches this year and marmalade when the oranges ripen and jars of lemon butter and frozen lemon juice a little later and if I can find a way to keep the canny little birds OUTSIDE the netting I'm going to do figs in port wine..which I haven't done for what seems like an eternity. The strawberry guava looks a bit sad so there will be no guava jelly this year. Too much rain I think. I swap jams/jellies for chutneys with the sister-in-laws :). I am in the thick of making bottles and bottles of apricot jam and chutney at the moment and will post some recipes as soon as I have successfully worked through Mount Apricot. I grew up on a farm in Iowa and we canned or froze everything we grew. I continued the practice during my married years here in North Texas. Most years I can green beans, tomatoes,black-eye peas, beets, and freeze okra, squash(both winter and summer squash), zucchini. I have peach trees and strawberries and freeze both when abundant. I so enjoy having all of this in my pantry and freezer. I just bought locally grown beef, so have a freezer full of beef at the moment! I'm blessed and ready for winter! Although we live in the same country, we may as well be on opposite sides of the world. We have the shortest growing season here and the rest of the year the intense frosts and wet gets to everything so we have to be clever and preserve as much as we can while we can. In season I jam, sauce, freeze and bottle. We sell some of it but it is always a matter of working out how much we will use over the rest of the year. This year is particularly frustrating as we have long finished all of our preserved stores but because of the unseasonably cold and wet weather, we have barely got anything to harvest. Thanks also for the insightful comment you left on my Foxs Lane blog. It was great to hear your opinion. I make all my own chutneys, jams, jellies, pickles etc using produce grown in the garden, picked from the hedgerows or bought (local produce if possible) from the greengrocery warehouse in town. They often have reduced produce for £1 a box - 8lbs fruit or vegetables normally - which need using quickly and I have a freezer-full of fruit bought this way. Bottling fruit is something I keep saying I will do, but need to get in a stock of the correct jars. So far I have only preserved beetroot with the help of my mum, we use the pressure cooker, and the sterilized jar method, hot sugar and vingegar...nothing beats it for taste. I live in New Hampshire,so our growing season is only four-five months long (unless you have a greenhouse or cold weather hoops,neither of which we have).This past summer was my first year canning,and I started in July and ended in Sept. I canned lots of relish,bread and butter pickles,summer squash pickle,strawberry jam,and blackberry jam.I didn't have enough tomatoes to can.Next year we are going to expand so I will be canning even more!!! I am new to canning and am sticking to the no-fail recipes likes jam and salsa for now. Both are easy for beginners and I like that I have something on hand to give as gifts. I bought one of the canning books you recommended some time ago and it is very helpful. Thanks! I'm in Montana (US) so am one of those 4-seasons folk. I put up jams, pickles, chutneys and tomato sauces just about every year. The sort of jam and pickles depends on what fruit is abundant (and therefore inexpensive). I dehydrate gobs of small cherry and plum tomatoes- lightly sprinkled with sea salt before drying. They make a great snack as-is or can be tossed into soups & stews. This year I was finally able to get a large quantity of corn all at once so I put up a big batch of corn (it was pretty exciting to be able to finally use my pressure canner for something!) I'm hoping for better veg yields in next summer's garden so I can put up beans and beets and such. I dry lots of herbs for use in cooking and as teas. I let the hot peppers dry as well. This year I grew onions, and have a couple of small onion braids in my basement. I haven't done any canning of meats yet, mostly because it takes a lot of time and I'd rather spend my time doing other things than monitoring the pressure canner. Here in Nebraska, USA, I usually raise a large garden and can as much as possible. We can't garden all year long so putting up what we grow in the summer really helps the grocery budget in winter. The biggies for me are tomato products and soups. 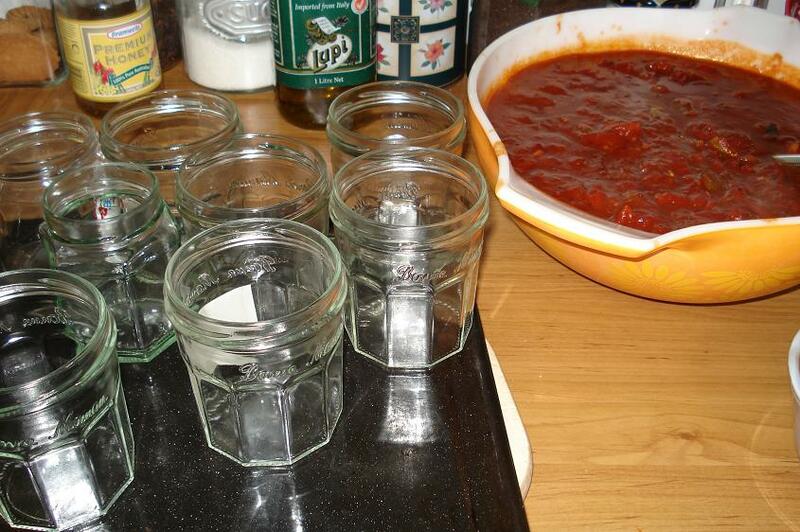 I usually can huge batches of pasta sauce, tomato soup, salsa, whole tomatoes, tomato sauce, and tomato juice. I also can large quantities of vegetable soup, chicken vegetable soup, and vegetable beef soup. Instead of driving through McDonald's on busy nights, home canned soups are my fast foods. Paired with slices of homemade bread you have a super quick, good-for-you dinner. I also can meats to have on hand for quick additions to meals. Beef, turkey, and chicken are so easy to can and are so convenient to add to casseroles or soups/sauces. I also try to can green beans and make pickles and fruit jellies. Canning is a lot of work but I love to do it. I taught myself to can by buying the Ball Blue Book of Canning and through trial and error have become very good at it. I'm able to buy canning jars by the box full at yard and tag sales. Ask older relatives or friends if they have canning jars they don't use anymore. My grandmother gave me over 50 nice pint size jars that she didn't use anymore. Thanks, Rhonda, for opening your home and heart to us readers, and for being tough enough to endure the scrutiny that sometimes comes with that. Since you are an inspiring teacher to most of us in terms of green living, I hope you feel entitled to the occasional imported item, when it suits you best, without feeling you have to justify your choices to us or anyone. If we had to be perfect at this endeavor, in order for it to 'count,' I would be too discouraged to even try. I freeze more than I can, including freezer jams, as I'm a bit chicken about the whole canning process. As part of my goal to buy less food in packaging, particularly BPA-plastic-lined canned goods, it's one of my new year's resolutions to learn how to can & overcome my fear! To whoever mentioned it, I love Cobram Estate olive oils. I buy the one in the purple bottle. It is nice enough to use in cakes! I'm only just getting started with preserving. I'm hoping we get a nice crop of peaches again this year. The plums are looking good, too. The main thing I make is jam. I usually make strawberry freezer jam during the late spring--I used to try to make a year's worth all at once, but the last few years I've been getting my berries from a local organic hydroponic farm--because of his setup he's able to grow berries longer, so I can space out my jam-making a little. And then I try to do some peach jam in late summer when the Georgia peaches are available. My goal for next year is to learn how to can jam so I don't need to freeze it. I would prefer to free up the freezer space for other things. you are all so impressive! i am just learning to preserve, i love it. we've just moved into the english countryside and i feel the real need to have a full pantry - especially when we got snowed in last week! i look forward to learning more and having so many good things put away for the cold months. if i can do things very well we will only be going out for fresh milk! Since we have had the allotment I have frozen lots of courgettes, beans, sweetcorn, peas and soft fruits.A glut of tomatoes was turned into tomato sauce and frozen.Excess beetroot and windfall apples were turned into a relish which gets better as it ages, and lots of soft fruits from the allotment and from foraging were turned into jam - when I spread it on my toast it is like a burst of summer sunshine. Potatoes, onions and squashes are stored in the garage. Wow, it's inspiring and daunting to read all these preserving stories. I am *very * new to the idea of preserving, it's not something my mother ever did... so far I have made apricot and peach jam the past two years, from a combination of fruit scavenged from "wild" & friends & bought by the box at markets, but I have not preserved anything we've grown ourselves. However this year we have lots and lots of rhubarb and our first crop of apples is growing, so maybe we can do something with those, plus you have inspired me to do something with the gazillion ripe lemons we have on the tree right now. Oh, and like Root&Twig said - if we had to be perfect I would certainly not be blogging myself! It is so wonderful to be able to learn from those further along the path than I am. I have been slacking lately in canning and preserving, however, I usually do strawberries, apples and tomatoes, of course! Our children are almost grown, so we do not need such a large garden anymore, but I am beginning to see that we actually do need to preserve our foods and get back to a more simple lifestyle. I'm so glad I found your blog!! You have so much great information. Can't wait for our Texas tomato season to get started!! My plants go in the ground right after Valentine's day! I'm in the process of making marmalade and I've run out of jars. The cheapest I can find (still in stock) are about £1.50 each. I can go to Tesco and but a jar of their cheapest own brand jam (Lemon curd) for 22p, throw away the jam ans still be £1.28 in profit on the jar!